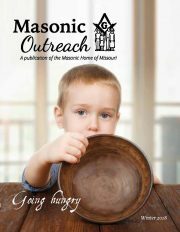 The Children’s Outreach program provides financial assistance to legal dependents of Missouri Masons or Missouri female members of the Order of the Eastern Star. This program alleviates the financial strain on parents who may have health insurance, but are struggling to afford co-payments and other medical expenses not covered by insurance. In Fiscal Year 2018, the Masonic Home provided $19,000 through the Children’s Outreach Program. We know there are many other children out there who need our help! The parent or legal guardian only needs two years of Missouri Masonic membership prior to application to qualify. Legal de­pendents must be 21 years of age or younger or over the age of 21 with a physical or mental disability. The parents or legal guardians of the child must complete an application to demonstrate a financial need. Mail/Fax: Download the initial application and mail or fax it to us at 573-814-4660.